A good filing system is a thing of beauty. It works, smoothly and efficiently, allowing you to access the data you need, whenever you need it. 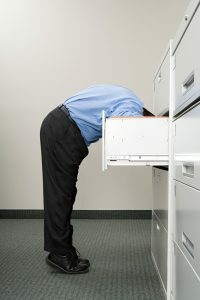 A bad filing system, however, is likely to end up with you running around like a headless chicken because your line manager wants to see that sales report you wrote six months ago and you can’t remember whether you filed it under Sales, Reports, or some other heading that seemed sensible at the time. Which, ironically, isn’t simple to achieve. And yet this should be your ultimate goal. Because complicated filing systems end up with people stuffing files in bottom drawers and eventually losing them. Even the most complex collection of data can be streamlined into a slick system if you put enough thinking and planning time in at the beginning. Don’t skip this stage! There’s only one constant, they say, and that’s change. Rigid things struggle with change. Flexible things find it easier. That goes for everything from people to filing systems. But as this blog post is about filing systems, just focus on that and make sure that your system will be able to adapt to whatever the future brings. This probably means you’ll need to monitor, review and possibly tweak your filing system as you go along. This doesn’t just mean not leaning a flipchart board against the filing cabinet. Think about who is going to use this system. Are they all based in the same office? If not, how are you going to get files to them? And it’s not just a case of physical access. People need to understand the filing system so they can get hold of what they need quickly and easily – and, just as important, put it back in the right place – and not have to wait for Sandra the admin girl to get back off her holidays. Unless you’ve got access to endless amounts of free storage space, a large physical filing system is going to end up costing you an awful lot in rent. Minimising the amount of printed paper data you need to store by aiming for a paperless office system is by far the best option. Then get clever with how your files are stored and stacked, remembering the accessibility issue we talked about a minute ago. So your documents are perfectly organised, indexed and stored – but what happens if there’s a fire? Or a flood? Or, indeed, an alien invasion? Paper files are particularly vulnerable to being destroyed because they’re pretty flimsy, when you think about it. Also the very fact that they exist in the physical world means they can get lost or put in the wrong place and then it becomes a major mission to find them. One solution to all of the issues above is to go digital. Digital filing systems still need planning and thought at the set-up stage, and you do have to think about security issues, but you could save yourself a heck of a lot of space, share files quickly and create back ups in case things go wrong. If you genuinely need your paper records though, professional off-site storage offers a climate controlled, alarmed and monitored space that will vastly improve the safety of your documents. At Scan Film or Store we can also get copies of documents to you on a same day basis, thanks to our really-rather-clever barcoding system, and we’ll always put them back in the right place. Or you can use our scan-on-demand service and potential have your file within two hours. Impressive, right? So if your filing system is less than efficient and you’d like some help getting on top it, give us a ring and we’ll be happy to talk you through the solutions that will work best for you within your budget.